Bienvenue dans notre Maison de vacances au cœur des Rocheuses canadiennes. Nous sommes fiers de couvrir tous les détails pour vos vacances car nous avons fourni notre condo avec tous nos articles favoris de notre propre maison. Il est important que notre unité répond à vos attentes. La suite à trois chambres est parfaite pour les rassemblements afin que tous puissent être ensemble mais disposent encore de leur propre espace privé. Inclus dans votre séjour est le WiFi gratuit, passe le parc pour Banff, 2 ponts privés et entièrement équipé pour votre échappatoire à Canmore. Les taux de change sont en USD. suite pouvant accueillir confortablement 7 situé au centre ce qui en fait une grande valeur avec tous les conforts de la maison entièrement équipée. Very comfortable unit in a beautiful, convenient setting. We needed space for a group of 6 people for a ski trip, and this place was great. The Safeway and rental shops are right next to the condo, so it was very convenient. It was a nice unit - seems like it was remodeled not that long ago. Very comfortable. I would certainly look to stay there again when back in Banff area. Everything promised was provided, and more. It was nice to see the welcome note on the chalkboard at the entrance, as well as the gift of wine and snacks. Even a couple of biscuits for the dog! We found another surprise in the fridge... muffins and such for us to enjoy as we settled in for our stay. The personalized message and the gifts from the property owner, Chad, were very thoughtful. It made us feel welcome and at home. Communicating with Chad was easy. If we had a question he was quick to respond. We loved the open concept livingroom/kitchen, and the bedrooms were very comfortable. The central location of the property to various attractions made it very convenient. We would highly recommend this property to our friends, and we would definitely consider staying there again in the future. The condo was better than we expected and we appreciated the personal touches like local fresh picked apples and the Banff Park Parking Pass. Chad was very helpful and available. The location of this condo made it very easy to walk the dog each morning, walk to Starbucks, walk to grab some grocery store items at Safeway, walk to the pharmacy, and SO much more. This location of this beautiful condo was the icing on the cake!! We will return to Banff in the summer (God willing) and we will absolutely reserve this condo with Chad again. We had an amazing stay. Great location to go to Banff. Very convenient to supermarkets. Clean and warm place. Kitchen has everything needed to cook meals. Comfortable beds, bathrooms have all necessities, and in-unit washer/dryer. Great host, thanks Chad! We hope to come back soon! Very nice condo, well appointed. Only complaint is there is no way to get a breeze through the condo to cool off at night and the AC units that were there could not keep up. Walked into the unit and it was extremely hot. This condo was fantastic! 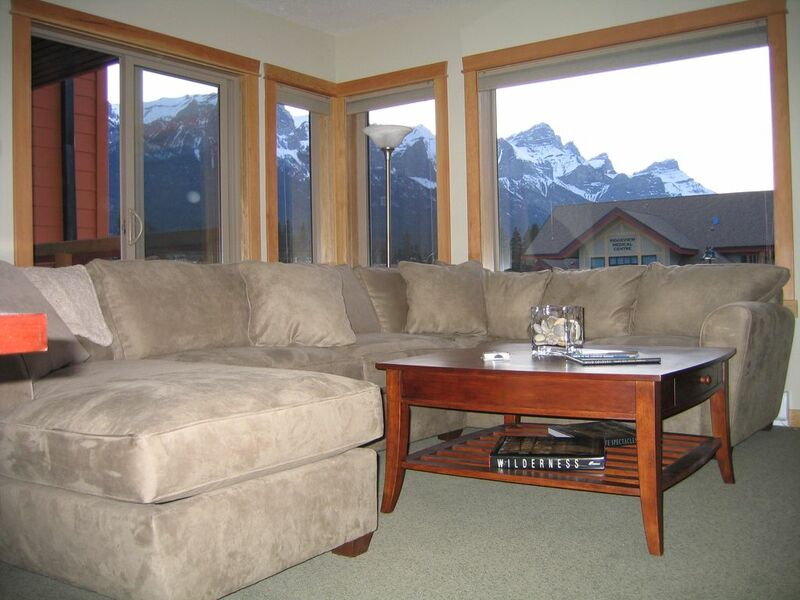 Canmore is iIdeally located to both national parks, and away from the crowded, touristy Banf. The property was very clean and had everything we needed. Appreciated the quiet location with fabulous views. Would definitely stay here again. Rates are in USD Our 5 star cleaning is done before and after each guests stay! The cleaning fee depends on number of guests, length of stay, and any special requests - $120-250.